← We’ll See You All in the Fall! Meanwhile, Read Latinx Books! Reviewed by Cindy L. Rodriguez and Cecilia Cackley; ARC received from Sourcebooks Fire. DESCRIPTION FROM THE PUBLISHER: Nothing says Happy Birthday like summoning the spirits of your dead relatives. OUR TWO CENTS: We’re thrilled to kick off our new blogging year with a celebration of Labyrinth Lost, an action-packed, urban, portal fantasy with a powerful, complex Latina main character. This novel tackles family, friendship, love, survival, and self-acceptance all while Alejandra Mortiz and her friends Nova and Rishi fight for their lives in a dangerous underworld. Alex, a 16-year-old Ecuadorian-Puerto Rican, has been fighting against her magical powers for years, feeling her growing abilities are more of a burden than a blessing. She believes her magic is responsible for her father’s disappearance, and she fears more harm will come to herself and her family if she wholly embraces her magic during her Deathday ceremony. Alex, therefore, sabotages the ceremony, which causes her family to be kidnapped from their Brooklyn home to Los Lagos, where they may die at the hands of The Devourer, an evil, power-hungry bruja who’s happy to destroy anyone who gets in her way. The first few chapters really establish Alex’s character and her position in her family so that you understand and care about how conflicted and guilty she is about her family’s disappearance. The stakes could not be higher, and you want Alex to succeed. Alex’s journey through Los Lagos feels very classic. The different communities she encounters, each with its own history and strengths and weaknesses, may remind readers of classic adventures like The Odyssey, Dante’s Inferno, and Alice in Wonderland. Every new area of Los Lagos brings a ton of action. Not every writer can create battle scenes so the reader can clearly visualize them without having to re-read. Zoraida is GREAT at this. For those who like some romance with their action-adventure story, Labyrinth Lost delivers there as well. Alex has feelings for both Nova and Rishi throughout the narrative, making her one of the few bisexual Latinas in young adult fiction. We especially love that neither Alex’s bisexuality nor her bruja lifestyle are depicted as “issues” or morally problematic. Alex struggles to accept the responsibility and consequences of her magic and her place within her immediate family and the larger bruja community with its deep history and traditions. But, neither her cultural identities or sexual preferences are depicted as “the problems,” thank the Deos. Labyrinth Lost, the first in a series, ends in a way that will leave you hungry for the sequel with promises of further family complications and more development of secondary characters, Nova and Rishi. We can’t wait! include this novel in a study of the supernatural, and witches specifically, in literature, along with titles such as MacBeth. AND NOW FOR TONS OF AWESOME BONUS STUFF, including Chapter 1, the book trailer, and a giveaway!! Tell us the secret of your death. The second time I saw my dead aunt Rosaria, she was dancing. But I was seven and asked too many questions. Every Sunday, cars piled up in our driveway, down the street, and around the corner of our old, narrow house in Sunset Park, Brooklyn. Mom’s Circle usually brought cellophane–wrapped dishes and jars of dirt and tubs of brackish water that made the Hudson River look clean. This time, they carried something more. When my sisters started snoring, I threw off my covers and crept down the stairs. The floorboards were uneven and creaky, but I was good at not being seen. Fuzzy, yellow streetlight shone through our attic window and followed me down every flight until I reached the basement. A soft hum made its way through the thin walls. I remember thinking I should listen to my mom’s warning and go back upstairs. But our house had been restless all week, and Lula, Rose, and I were shoved into the attic, out of the way while the grown–ups prepared the funeral. I wanted out. I wanted to see. The night was moonless and cold one week after the Witch’s New Year, when Aunt Rosaria died of a sickness that made her skin yellow like hundred–year–old paper and her nails turn black as coal. We tried to make her beautiful again. My sisters and I spent all day weaving good luck charms from peonies, corn husks, and string—-one loop over, under, two loops over, under. Not even the morticians, the Magos de Muerte, could fix her once–lovely face. Aunt Rosaria was dead. I was there when we mourned her. I was there when we buried her. Then, I watched my father and two others shoulder a dirty cloth bundle into the house, and I knew I couldn’t stay in bed, no matter what my mother said. So I opened the basement door. Red light bathed the steep stairs. I leaned my head toward the light, toward the beating sound of drums and sharp plucks of fat, nylon guitar strings. A soft mew followed by whiskers against my arm made my heart jump to the back of my rib cage. I bit my tongue to stop the scream. It was just my cat, Miluna. She stared at me with her white, glowing eyes and hissed a warning, as if telling me to turn back. But Aunt Rosaria was my godmother, my family, my friend. And I wanted to see her again. “Sh!” I brushed the cat’s head back. Miluna nudged my leg, then ran away as the singing started. I took my first step down, into the warm, red light. Raspy voices called out to our gods, the Deos, asking for blessings beyond the veil of our worlds. Their melody pulled me step by step until I was crouched at the bottom of the landing. Brujas and brujos were dressed in mourning white, their faces painted in the aspects of the dead, white clay and black coal to trace the bones. They danced in two circles—-the outer ring going clockwise, the inner counterclockwise—hands clasped tight, voices vibrating to the pulsing drums. And in the middle was Aunt Rosaria. Her body jerked upward. Her black hair pooled in the air like she was suspended in water. There was still dirt on her skin. The white skirt we buried her in billowed around her slender legs. Black smoke slithered out of her open mouth. It weaved in and out of the circle—-one loop over, under, two loops over, under. It tugged Aunt Rosaria higher and higher, matching the rhythm of the canto. Then, the black smoke perked up and changed its target. It could smell me. I tried to backpedal, but the tiles were slick, and I slid toward the circle. My head smacked the tiles. Pain splintered my skull, and a broken scream lodged in my throat. The music stopped. Heavy, tired breaths filled the silence of the pulsing red dark. The enchantment was broken. Aunt Rosaria’s reanimated corpse turned to me. Her body purged black smoke, lowering her back to the ground. Her ankles cracked where the bone was brittle, but still she took a step. Her dead eyes gaped at me. Her wrinkled mouth growled my name: Alejandra. She took another step. Her ankle turned and broke at the joint, sending her flying forward. She landed on top of me. The rot of her skin filled my nose, and grave dirt fell into my eyes. There was the scent of extinguished candles and melting wax. Decay and perfume oil smothered me until they pulled the body away. My mother jerked me up by the ear, pulling me up two flights of stairs until I was back in my bed, the scream stuck in my throat like a stone. I lay still. So still that after a while, she brushed my hair, thinking I had fallen asleep. I wasn’t. How could I ever sleep again? Blood and rot and smoke and whispers filled my head. “One day you’ll learn,” she whispered. 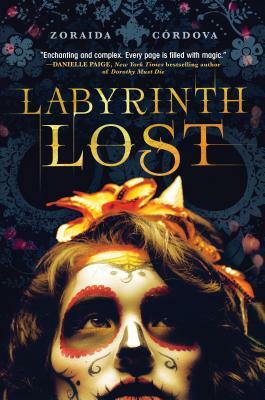 To find Labyrinth Lost, check your local public library, your local bookstore, or IndieBound. Also, check out Goodreads, Amazon, and Barnes & Noble. You can also…..
ABOUT THE AUTHOR: Zoraida Córdova was born in Ecuador and raised in Queens, New York. She is the author of The Vicious Deep trilogy, the On the Verge series, and Labyrinth Lost. She loves black coffee, snark, and still believes in magic.